Today, "X" marks the spot... on this Treasure Map Generator. Tired of generic "treasure maps" that lead to buried treasure? 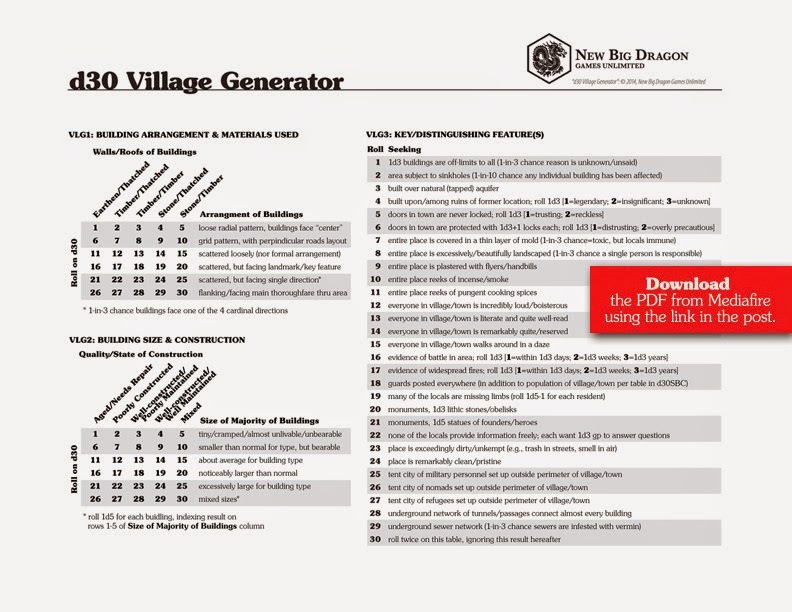 Use this generator to generate more interesting maps, and even determine if they're usable at all! 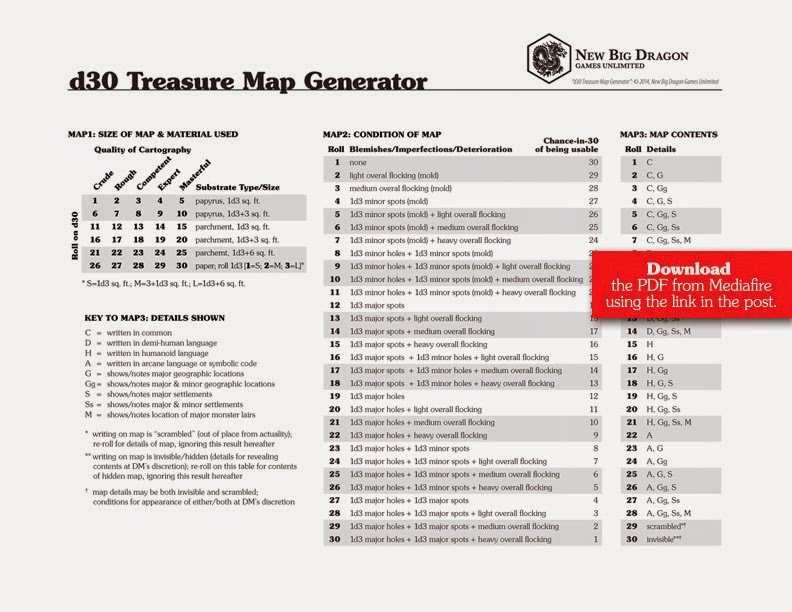 d30 Treasure Map Generator from MediaFire. 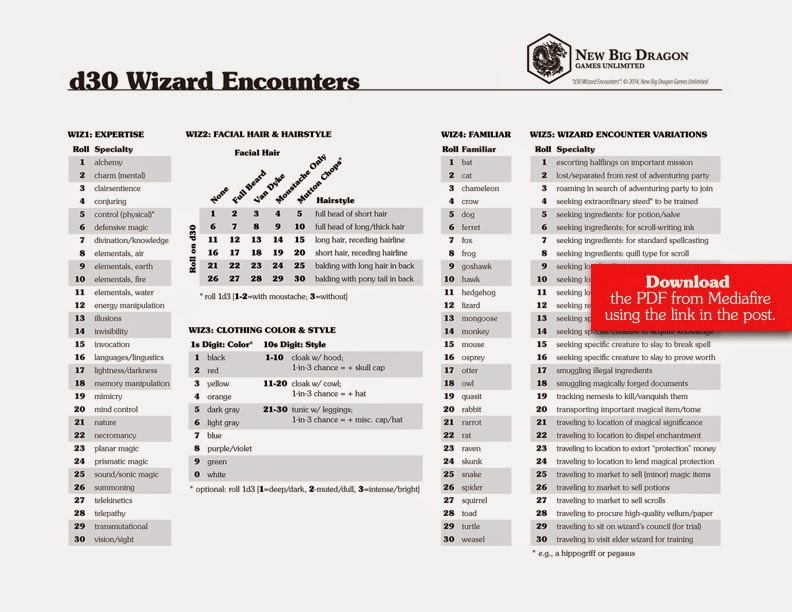 d30 Wizard Encounters page from MediaFire. I fully expect this to be the most downloaded PDF for the month. 'Nuff said. 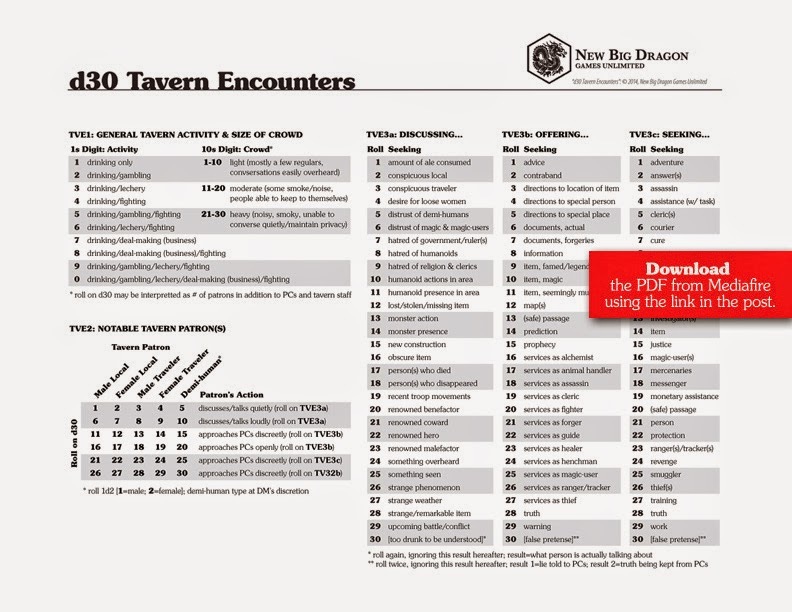 d30 Tavern Encounters page from MediaFire. I know these encounter charts by terrain aren't as popular as some of the others I've been doing, but I really like these for a couple of reasons. When you think about it, they really provide you an overview of what should/shouldn't be common in an area. The way I look at it, the common and uncommon types should be the basis for your wandering monster charts in any given area (e.g., roll for 6 different commons types, and 2 uncommon types). 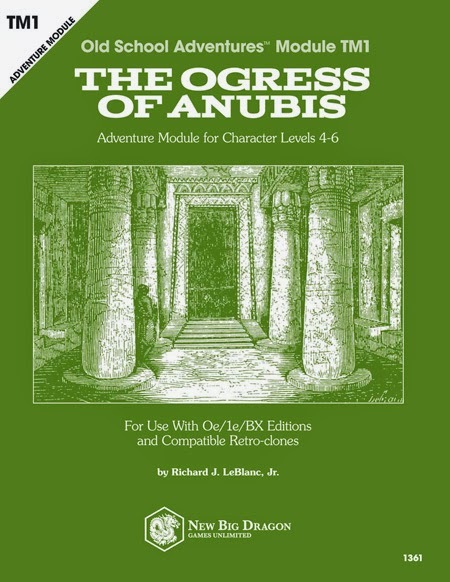 Then use a few rare types and 1 very rare type as the centerpieces for adventures in the area. Then everything makes sense naturally. I truthfully believe this is why the founding fathers included frequency as part of the 1e MM listings. 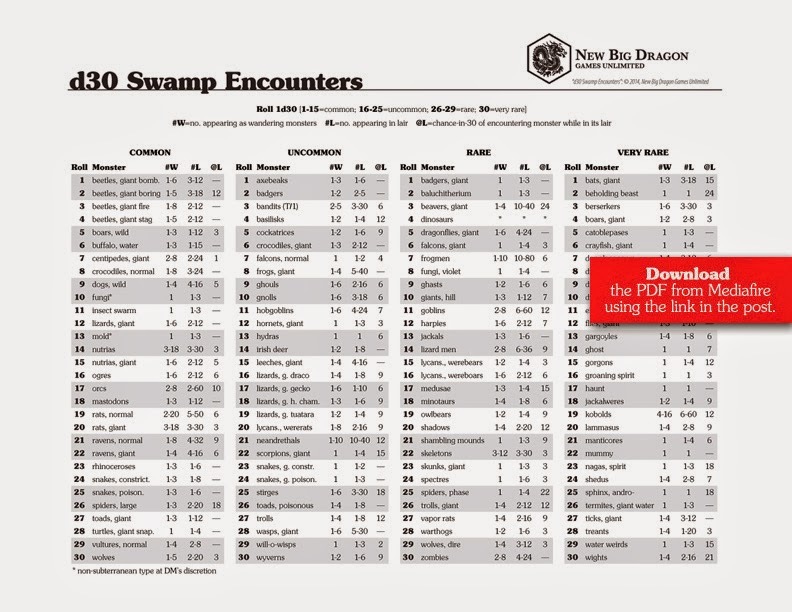 d30 Swamp Encounters page from MediaFire. Let's face it, we'd all use more sphinxes in our games if we just had more riddles lying around. Okay, we wouldn't, but you can never go wrong with a decent riddle or two thrown in to your adventure. Most of the riddles on this PDF are taken from Heithreksgátur ("The Riddles of Heithrek"), a series of verse that should have probably been included in the Poetic Edda, but wasn't. 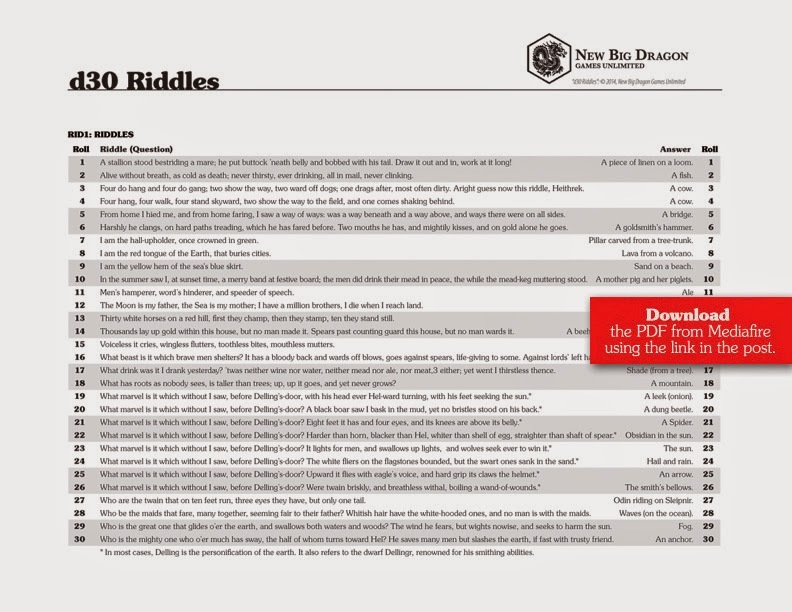 d30 Riddles page from MediaFire. Today's chart is based on an idea I've had for quite a while. 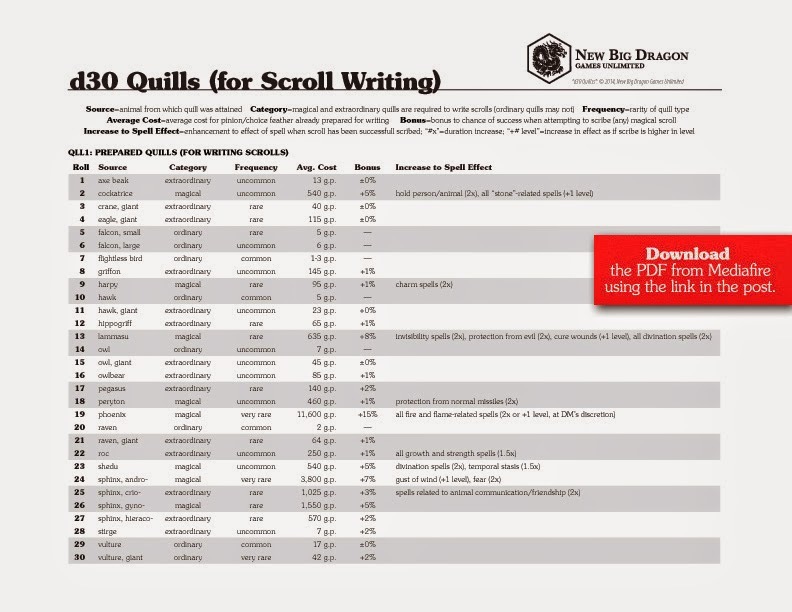 In the 1e DMG, you'll note that, in order to manufacture a scroll, "A fresh, virgin quill must be used for each spell transcribed." Furthermore, "the quill must be from an animal of a strange or magical nature." Okay... so how often has that character sat down to manufacture a scroll, and assumed they were doing it with a goose, duck, or chicken quill? Not gonna work, my friends. And where are they getting those strange and extraordinary feathers needed to prepare them for writing (and thereby turning them into a "quill proper")? Especially considering they need a new quill after each spell. Yes! Not each scroll, but each spell! So what I've done is outline a list of extraordinary (i.e., "strange") and magical creatures that have feathers (as well as a couple others of a "normal nature" beyond the standard 1 gp goose, duck, chicken). I've calculated costs for a prepared quill (not the same as a raw feather, mind you), and how that affects the scribe's chances for scribing the scroll, as well as any possible increased effects that may result if the scroll is scribed successfully using that quill. Use this chart to stock that magic-item shop. Throw a couple into that secret study behind that secret door in that evil MU's bedroom. Put a few in a small scribe's case and mix it in with that treasure horde. d30 Quills page from MediaFire. 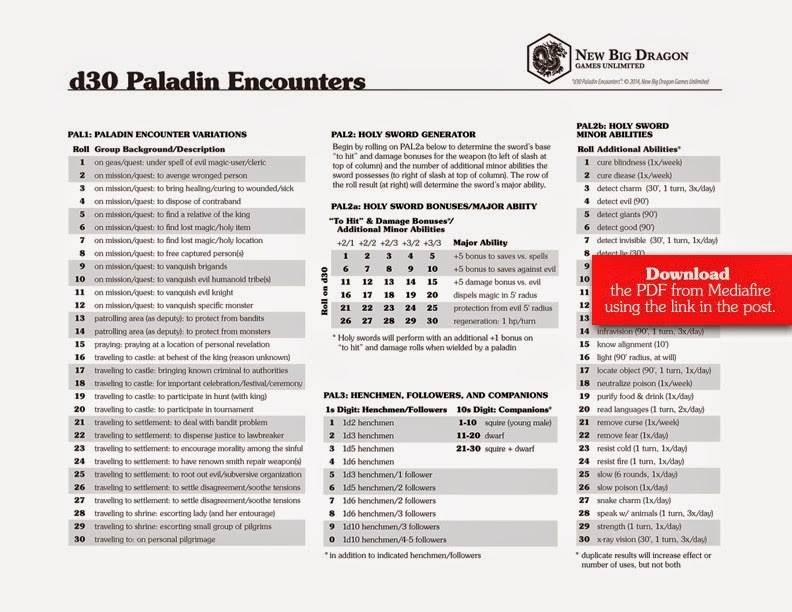 d30 Paladin Encounters page from MediaFire. 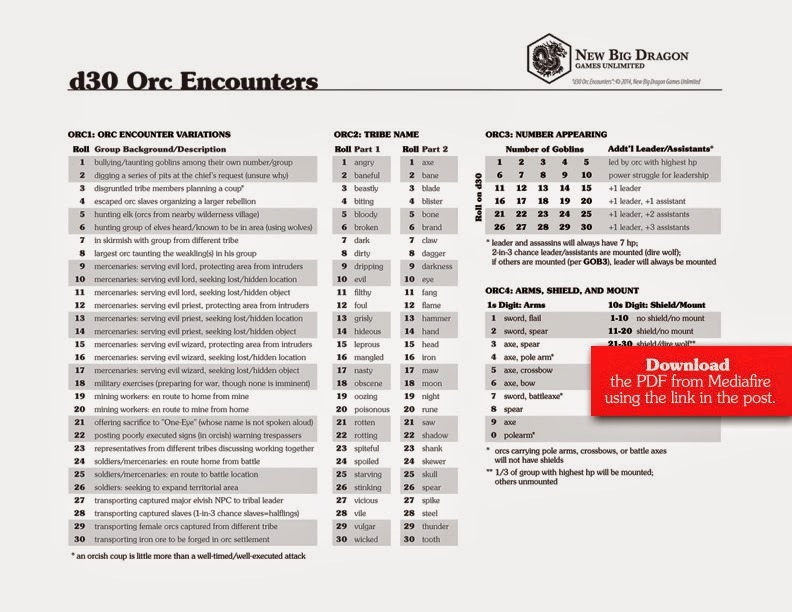 d30 Orc Encounters page from MediaFire. Haven't you always wondered what's on those coins in that horde? Well wonder no more! 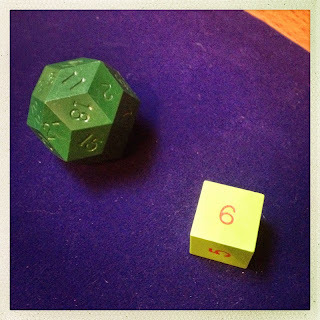 Simply roll a few d30's and figure it out! The first roll will determine what kind of image is on each of the coin's 2 faces. And the other rolls take it from there. 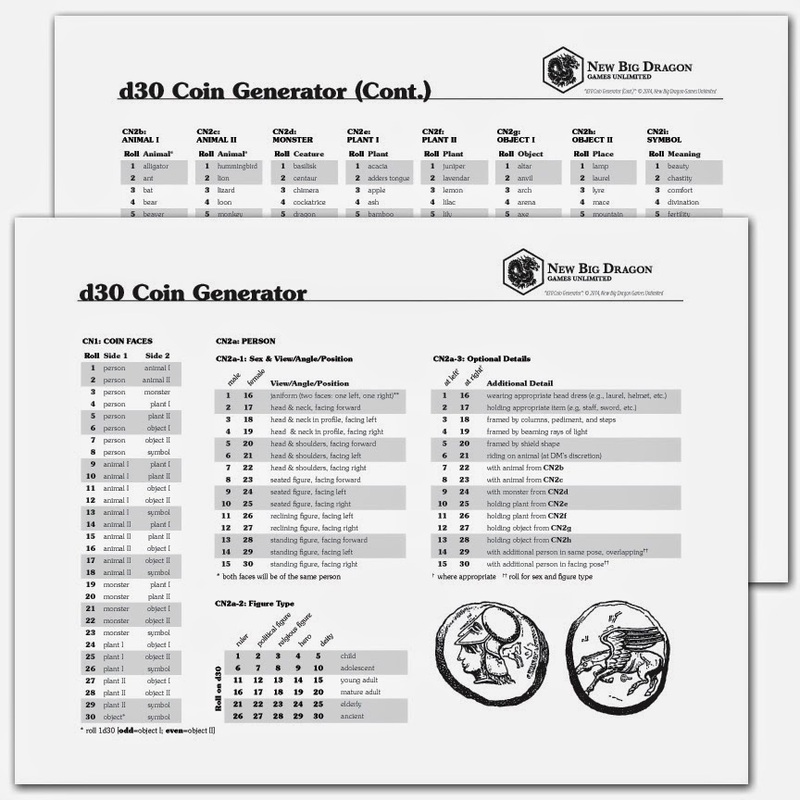 d30 Coin Generator from MediaFire. Whilst printing postage as part of fulfilling an order from the New Big Dragon Square storefront, I accidentally printed postage for the flat rate cardboard envelope rather than the flat rate padded envelope. That means I have a paid stamp ready to go for priority flat rate mail to a U.S. address, so I'm giving away a free print copy of The Ogress of Anubis. Simply post a comment at the bottom of this blog post by Midnight CST (US) tomorrow (Tuesday) night. On Wednesday, I will randomly choose a winner from the pile and send them a print copy of the book, along with a red/white New Big Dragon button! And if I somehow break 200 unique commenters, I will give away a second module/button set to a different commenter. 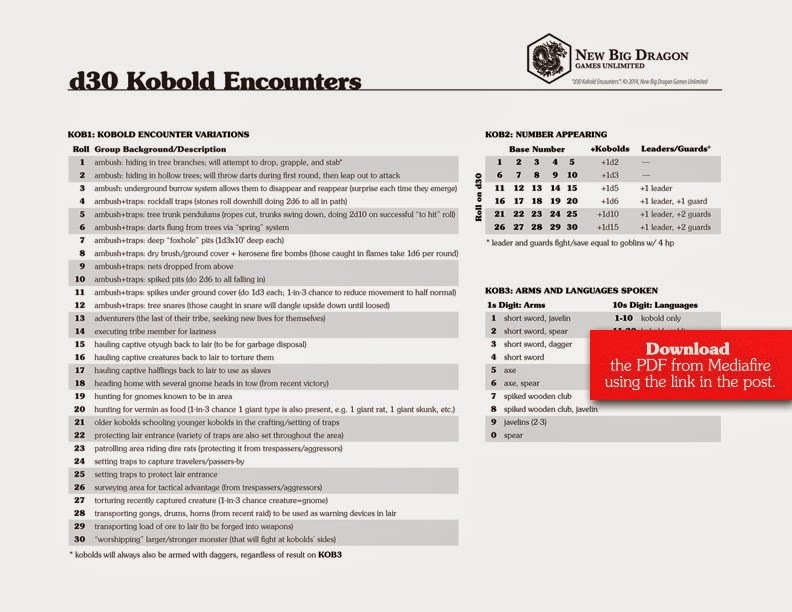 d30 Kobold Encounters page from MediaFire. 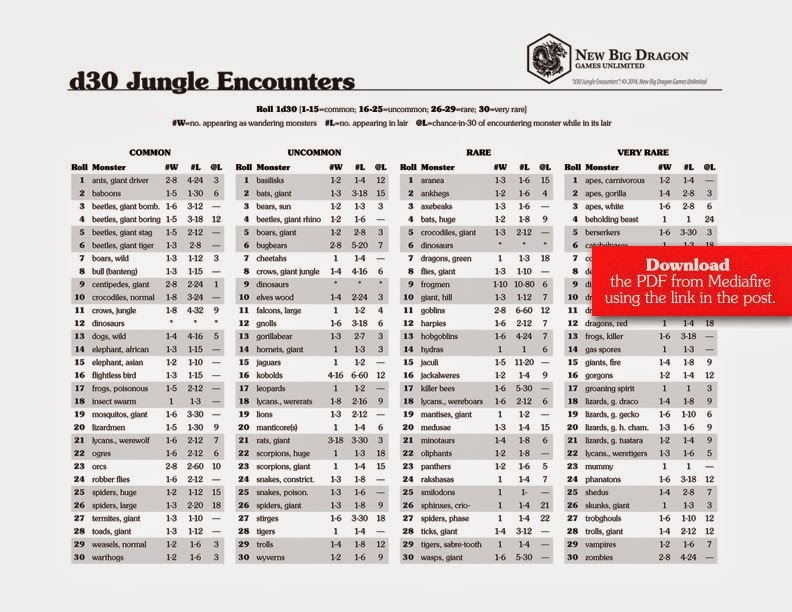 d30 Jungle Encounters page from MediaFire. This is the second of my possible four posts for the day for the letter "I." 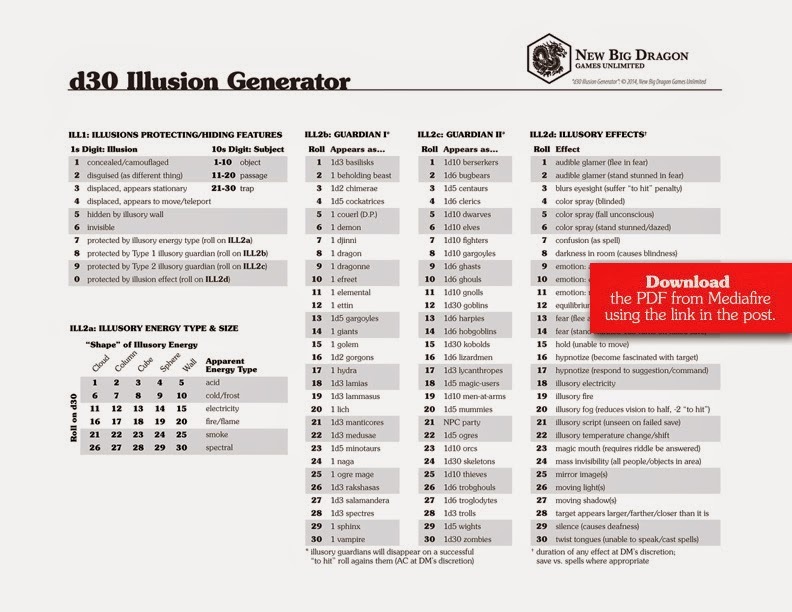 Earlier today, I released entry "9A" — a d30 Illusions Generator. In that post, I mentioned several "I" topics that I put up as candidates yesterday. 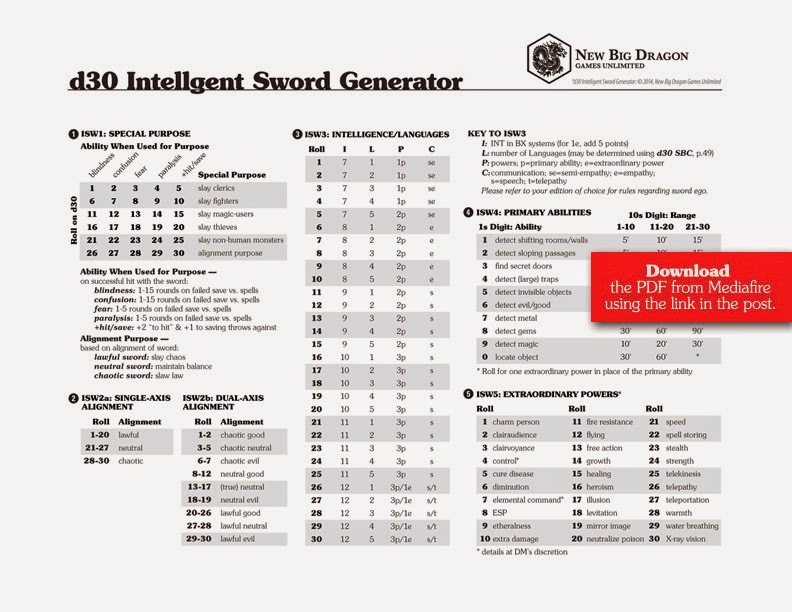 By the time the votes came in, I was already underway with the Illusions Generator, and had a start on this Intelligent Swords Generator. 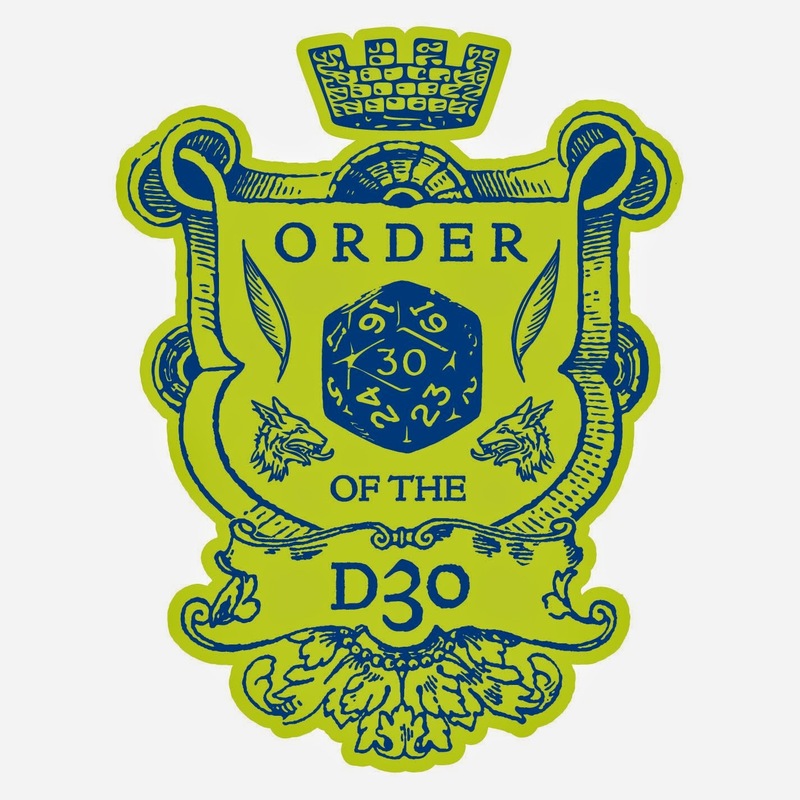 If time allows today, I plan on doing as much of the other two candidates as I can (a set of d30 injury tables, and some sort of d30 insanity tables). But we'll see how the day goes. 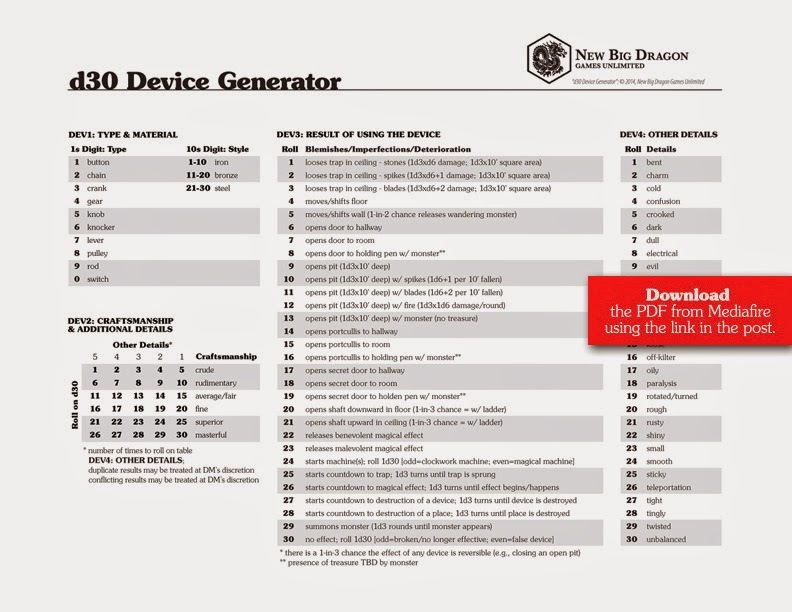 d30 Intelligent Sword Generator from MediaFire. 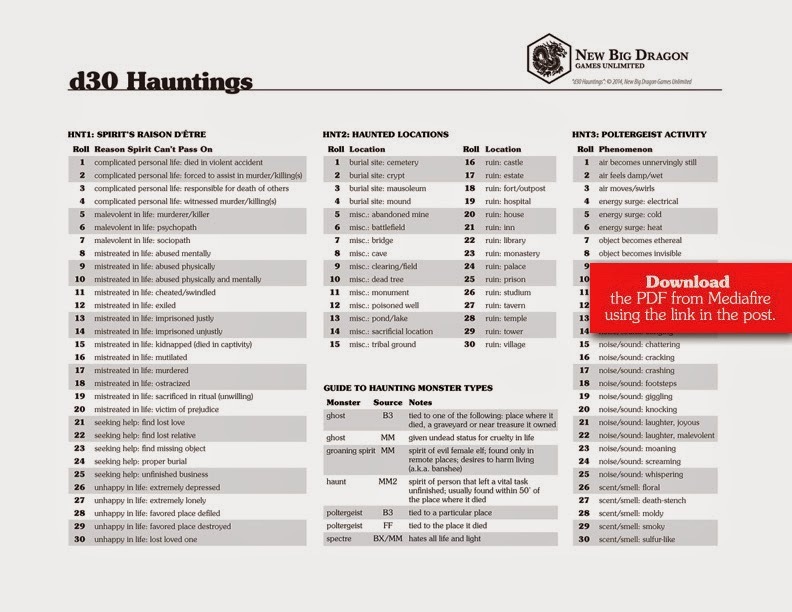 d30 Hauntings encounters page from MediaFire. This chart feels pretty balanced to me (as far as creating a good variety of what should be forest encounters, and how common or rare those encounters are). The chart is by no means exhaustive, but it's fairly comprehensive (culling from the 1eMM, as well as the monster sections of the BX books). I think these kind of charts do a particularly good job of putting the common/uncommon/rare/very rare monsters into perspective. For example, most of us probably think of skeletons being fairly common, especially compared to something like vampires. But in the 1eMM, skeletons and vampires are both officially "rare." Hmm. I did not attempt to convert the number appearing details into a strict d30 variant rolls. I think doing that really jacks with the way the numbers are generated, and levels out bell curves that shouldn't be leveled out. 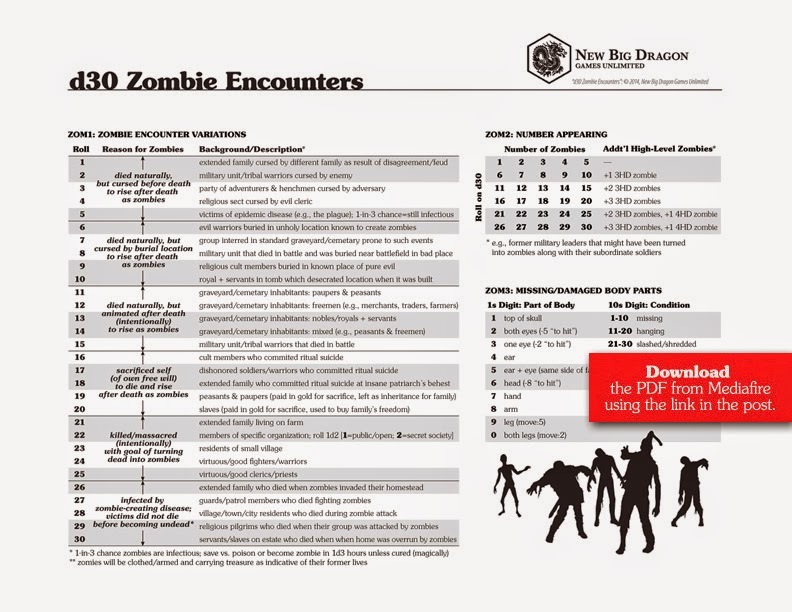 If you insist on rolling the number appearing with a d30, then I suggest checking out the Monster Encounters: Overview, Number Appearing Determination Chart on p. 14 of the d30 DM Companion. I should also let you know, these kinds of charts are pretty involved and time-consuming. 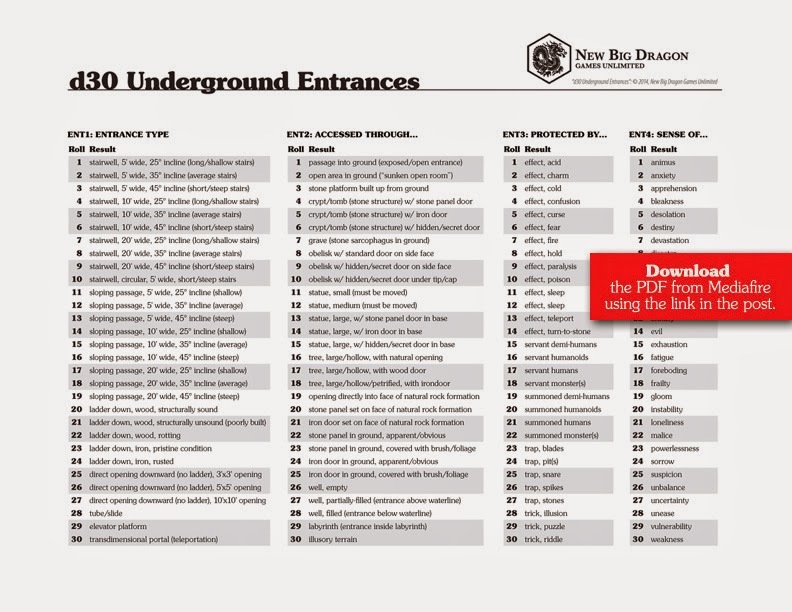 In fact, the wandering monster tables in the d30 DM Companion were some of the most time-consuming of the entire book. So don't think you'll see too many more of these kinds of charts between now and the end of this year's A-to-Z challenge. 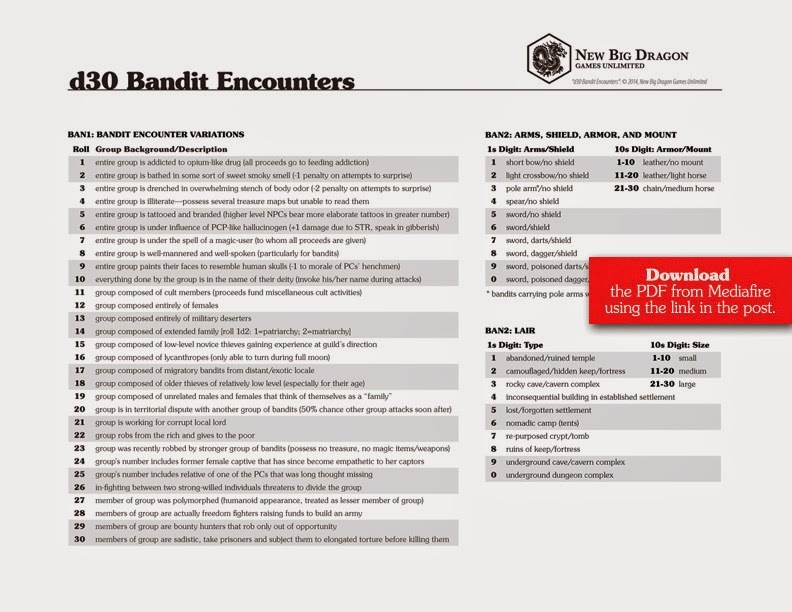 You're more likely to see the charts like the bandit, dwarf, and elf encounter tables. 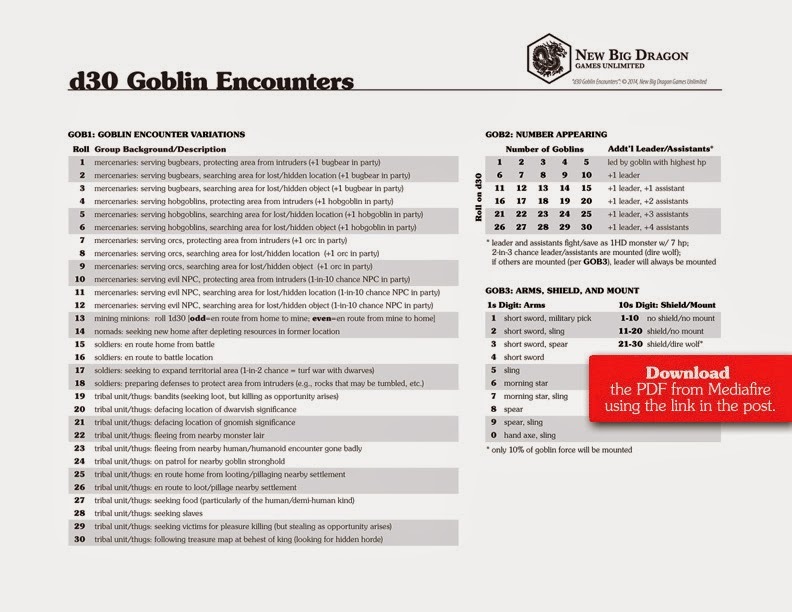 (In fact, tomorrow's chart will be a d30 Goblin Encounters chart, very similar to those.) While I do find tables like this Forest Encounters page handy, I prefer the storytelling aspects of the other type anyway. 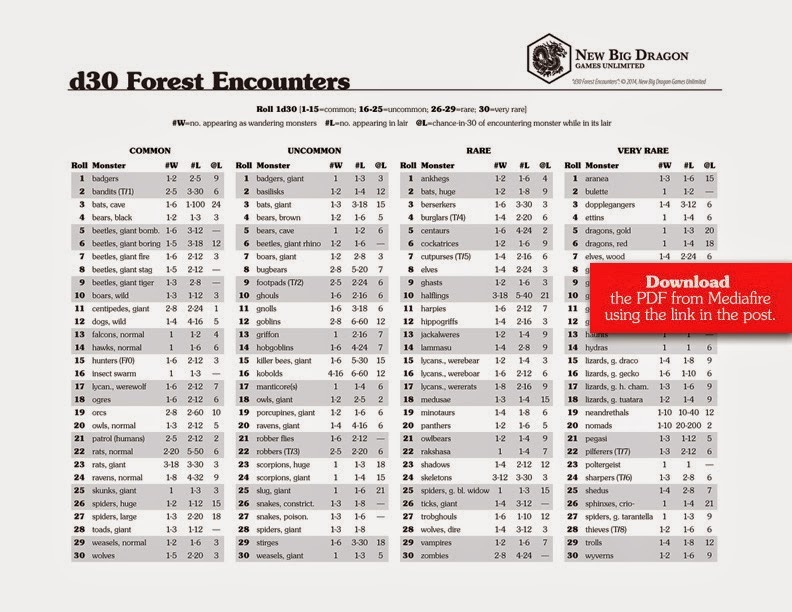 d30 Forest Encounters page from MediaFire. First off, thanks to those who've already bought from the storefront. It launched yesterday, and so far so good. so if you're outside the U.S., you'll still have to buy through Lulu. ordering direct from the storefront vs. buying through Lulu? 1. You'll save about $1 per title when buying individually. Lulu has a lot of margin built in for their vendors/operations. Without those middlemen, I'm able to offer much better pricing. 2. You can save even more on bundle deals. Again, something Lulu really can't do with print books. 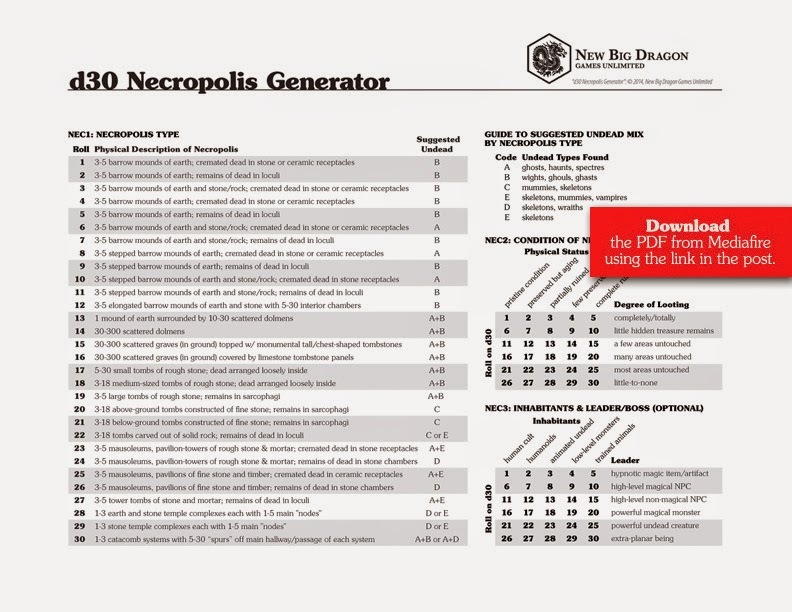 For example, if you buy the two d30 Companions as a bundle, you'll save another $1.95 (in addition to the $2 you're already saving). That makes a savings of about $4 vs buying those 2 books together from Lulu. If you buy all four titles together, you'll save almost $7 off the individual pricing (in addition to the $5 you're already saving off Lulu pricing), which makes a savings of about $12 – that's like getting a 33% OFF sale every day! 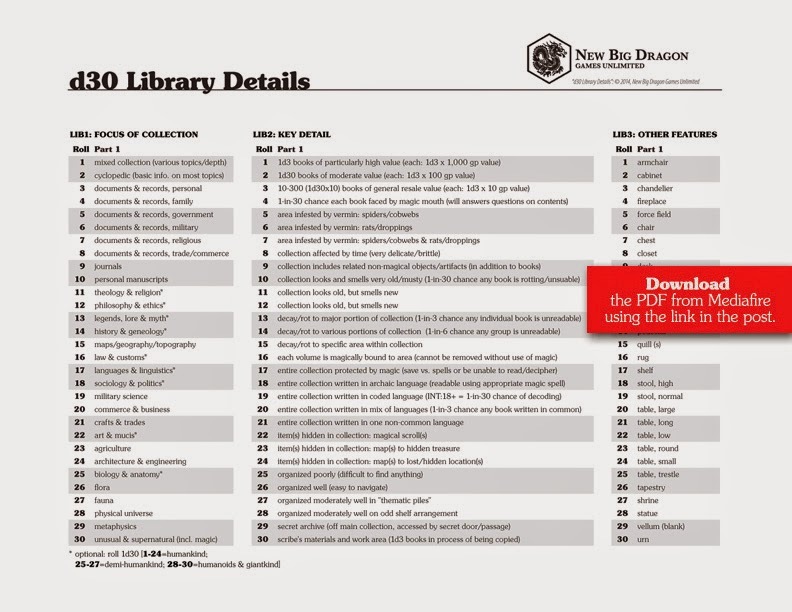 getting the free counterpart PDF of print titles is seamless! 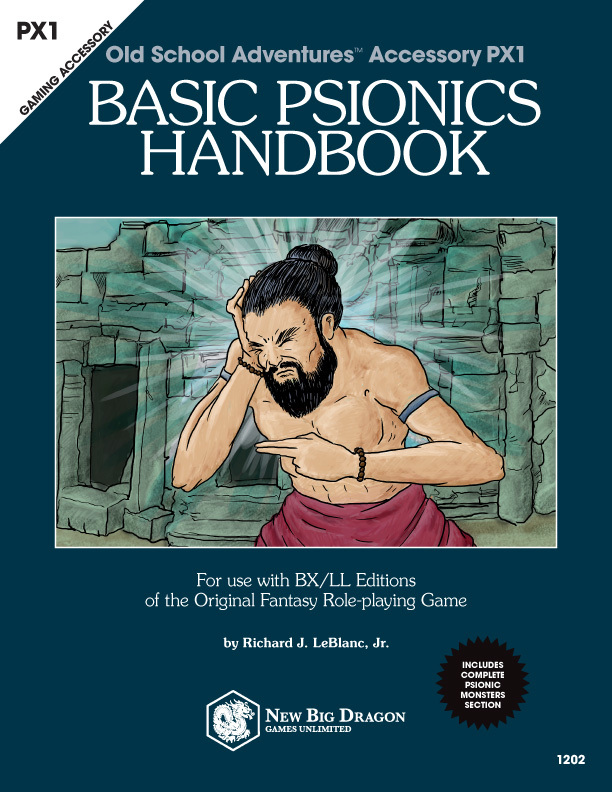 As soon as your order is processed (and moves into the "order fulfilled" stream on my end), you'll get an email to that address through RPGNow with a link to free PDF copies of the print titles you've ordered. No more having to email copies of your Lulu invoices to prove your purchase. 4. Generally, your order will ship 1-2 days after you order. 5. I can throw in added premiums. I'm sure there's some other things I'm forgetting here, but as the day/week goes on, I'll make sure to update this post with that information. 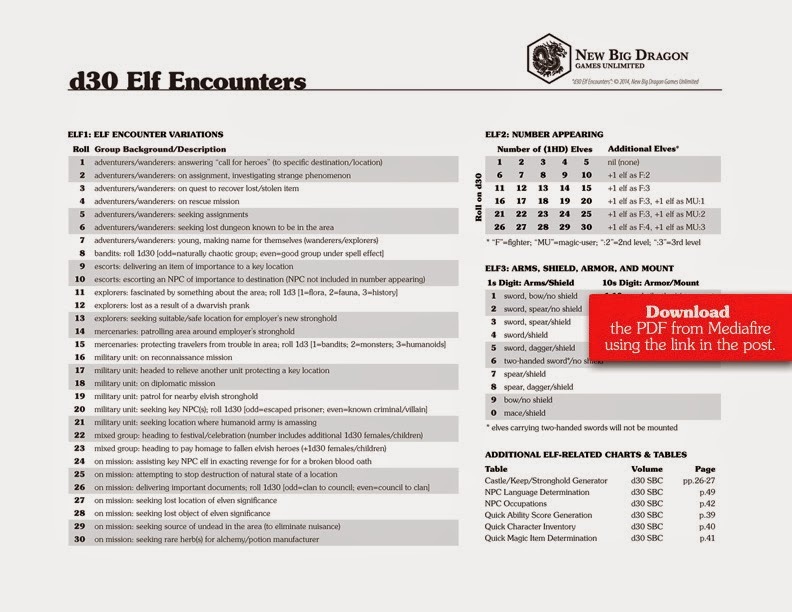 d30 Elf Encounters page from MediaFire. Yes. 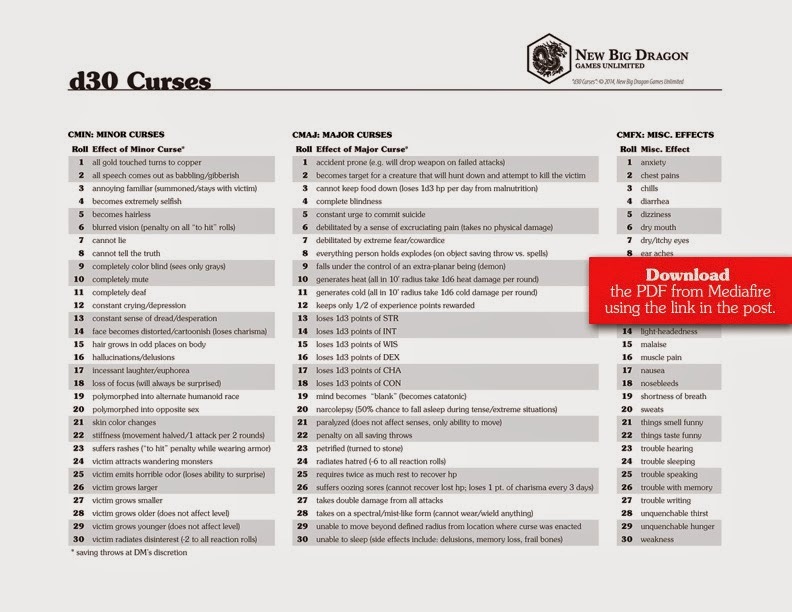 I know already I'm going to regret attempting a month straight of d30 charts. But here's my first A-to-Z blogging post for 2014... "A is for Altar." 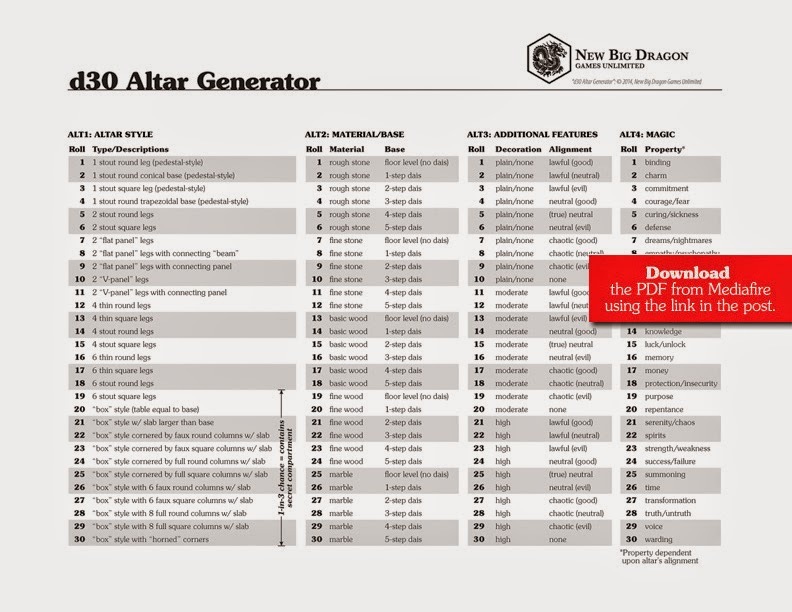 d30 Altar Generator from MediaFire.